1． For m6A sites with high confidence level, we retained the variants that located nearby the m6A sites and then looked for the variants that destroy m6A motif of the m6A sites. 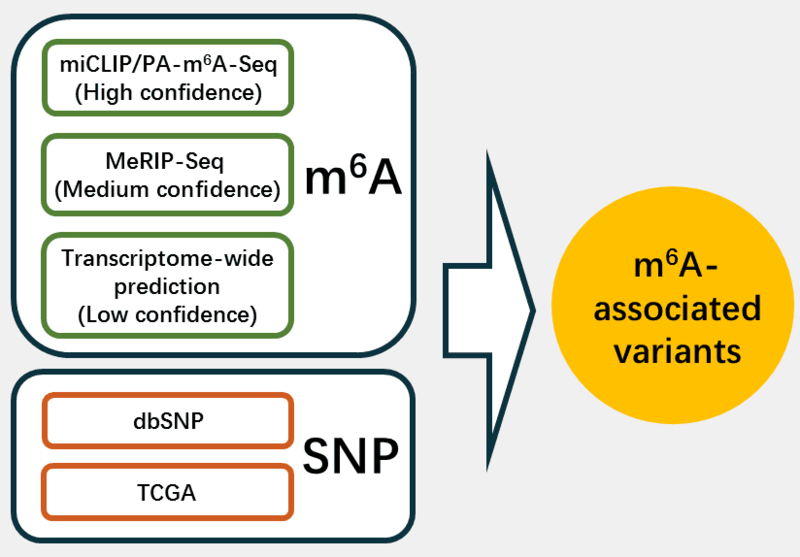 2． For m6A sites with medium confidence level, the m6A-associated variants were derived from the intersection between the variants and m6A sites generated from MeRIP-Seq experiments. Then, we applied our prediction models to find the variants nearby the m6A sites that change the sequence features essential for m6A modification. 3． For m6A sites with low confidence level, a genome-wide prediction based on Random Forest algorithm was performed for the sequences around all the collected variants from dbSNP and TCGA to find the variants that cause potential gain or loss of m6A sites. We collected millions of variants from dbSNP and TCGA project, as well as thousands of m6A sites from 7 miCLIP experiments, 2 PA-m6A-Seq experiments and 244 MeRIP-Seq experiments, together with a large number of predicted m6A sites are involved. 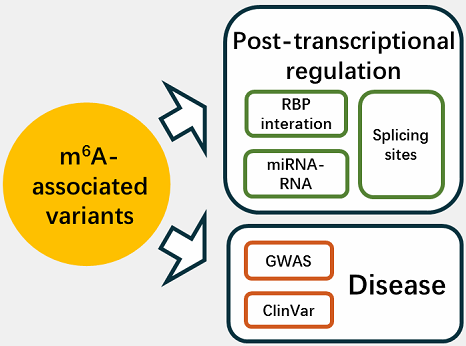 At present, m6AVar contains 414,241 m6A-associated variants, which are composed of 352,014 m6A-associated germline mutations from dbSNP and 62,227 m6A-associated somatic mutations from TCGA.